Saying the state’s contract offer is “unacceptable,” our members all over the state are taking action to press for a contract we can all be proud of. After negotiations reached a stalemate earlier this summer, Local 1000 members attended Town Halls up and down the state to voice their concern over the state’s offer, and their willingness to push for more. In response, the Local 1000 Strategy Team put together a robust strategic plan to move forward on the demand made by our members. At the end of August, our members brought the fight back to the worksites demanding CalHR to respect the important work we do for the State of California. 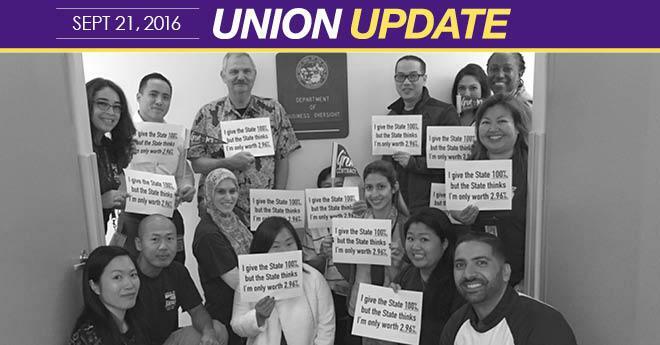 On Oct.10, our bargaining team will return to the table. Our members have demonstrated their support of the bargaining team each week by staying visible; showing solidarity and committing themselves to continuing the fight. Our Worksite Action Team Leaders continue having conversations every day on the importance of standing together. Our members by the thousands are taking the pledge to participate in actions that will help us achieve improvements in wages and working conditions.